FILE - The front facade of the Robert F. Kennedy Department of Justice Building is seen in Washington, in a June 19, 2015, photo. U.S. authorities are beefing up enforcement of the Foreign Corrupt Practices Act, the U.S. anti-foreign bribery law, bringing an ever larger number of corporate corruption cases in close coordination with foreign law enforcement agencies. In the last two years, the U.S. Justice Department and U.S. the Securities and Exchange Commission, the two agencies responsible for implementing the law, working with foreign law enforcement agencies, have brought enforcement actions against eight multinational companies, more than the previous years combined, according to Justice Department officials. FILE - U.S. Securities and Exchange Commission building, Aug. 5, 2017, in Washington. The surge is part of a growing trend in the war on corporate graft. Prior to 2016, there had been only two such cases. But as more countries have adopted anti-foreign bribery laws in recent years and cooperation between international law enforcement authorities has increased, so too have coordinated prosecutions of corporate corruption. "I think that speaks both to the level of cooperation that we're getting from other countries but also speaks to the engagement of foreign countries now," a Justice Department official said. Congress enacted the FCPA in 1977 in response to disclosures that U.S. companies were paying millions of dollars in bribes to foreign officials to obtain business deals. The law was later amended, giving the Justice Department and the SEC broad jurisdiction over foreign companies that have subsidiaries in the United States or trade on U.S. stock exchanges. Before he came to office, President Donald Trump was a harsh critic of FCPA, calling it a "horrible law" that made it difficult for U.S. companies to compete overseas. That led many to predict that anti-foreign bribery enforcement would take a back seat under his administration. But the speculation has not been borne out. While enforcement actions slowed down during the first half of last year, they picked up during the second six months. 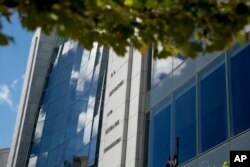 In total, 11 companies paid nearly $2 billion last year to resolve corruption charges, according to the FCPA Blog. Still, some critics worry that the Trump administration may try to go soft on Wall Street. "We're following very, very closely whether or not the Trump administration is going to take steps to weaken FCPA enforcement," said Raymond Baker, president of Global Financial Integrity in Washington and an authority on corporate corruption. Cross-border investigations and prosecutions of foreign bribery are not new but they've increased in recent years as a number of countries, under growing public pressure, have passed legislation to crack down on corporate crime: the U.K. in 2010, Brazil in 2014, the Netherlands in 2015, and France and Mexico in 2017. "Certainly, there has been a big push by the U.S. (Justice Department) and the SEC to get foreign countries to engage in this foreign bribery fight and I think it's been met with a lot of success," the official said. The push resulted in four major multi-jurisdictional cases last year, brought by law enforcement agencies in six countries in cooperation with dozens of other nations. In January, British engineering group Rolls-Royce agreed to pay $800 million in penalties to U.S., U.K. and Brazilian authorities to settle charges of bribing officials in a dozen countries in exchange for confidential information and securing lucrative business deals. 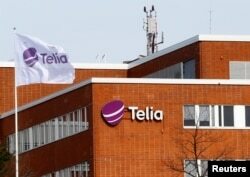 FILE - A flag flutters at the Telia telecommunication company headquarters in Helsinki, Finland, May 5, 2017. In September, Stockholm-based telecom firm Telia Company AB agreed to pay a record $965 million to U.S., Swedish and Dutch authorities resolve an investigation into bribing Gulnara Karimova, the daughter of Uzbekistan's late president, to win lucrative telecom contracts in the Central Asian nation. In November, Dutch oil services company SBM Offshore N.V. agreed to pay $475 million to Dutch, Brazilian, and U.S. authorities to settle a case related to making illegal payments to officials in Angola, Brazil, Equatorial Guinea, Iraq and Kazakhstan. 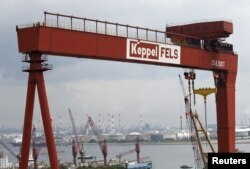 And in December, Keppel Offshore and Marine Ltd, a Singapore-based operator of shipyards, agreed to pay more than $422 million to Singapore, U.S. and Brazilian authorities to resolve charges of paying millions of dollars in bribes to officials in Brazil. FILE - A view of a Keppel Corporation shipyard in Singapore, Jan. 19, 2016. In each case, authorities coordinated their investigations and enforcement actions. And in each case, authorities acknowledged receiving significant investigative assistance from their foreign counterparts. In the case of Telia, for example, U.S. and Dutch authorities named nearly a dozen countries that provided "valuable assistance" with the investigation. The Telia case "demonstrates the Department's cooperative posture with its foreign counterparts to stamp out international corruption and to reach fair, appropriate and coordinated resolutions," Then Acting Assistant Attorney General Blanco said in announcing the settlement. Over the past five years, foreign requests for evidence and information to support foreign bribery investigations have increased 147 percent while U.S. requests for foreign assistance have surged by 75 percent, then Acting Principal Assistant Attorney General Trevor McFadden said at an anti-corruption conference in Brazil last year. "Increasingly, prosecutors around the world understand that investigating and prosecuting transnational crime necessitates transnational cooperation," McFadden said. Where formal information sharing mechanisms prove slow, investigators rely on personal relationships with their counterparts to share leads, witness identities, details from cooperating defendants, and other types of evidence, Patrick Stokes, a former head of the Justice Department's FCPA Unit, wrote in Law 360 last year. For multinational companies, the escalating international drive to clamp down on corruption carries great risk. Not only can they face criminal charges for the same misconduct in multiple jurisdictions but they also have to pony up hefty penalties. The fines, which often run in the hundreds of millions of dollars, have fueled criticism that FCPA enforcement has become a cash cow system lets companies off the hook in exchange for paying penalties. The Justice Department's increased scrutiny of corporate corruption has also been criticized for punishing the shareholders of publicly traded companies while not holding corrupt executives to account. In response, the Justice Department instituted a new policy three years ago to prioritize prosecuting executives in corporate corruption cases. That policy has continued under the Trump administration. Last year, 21 individuals were convicted of or pleaded guilty to FCPA-related charges, more than any other year in the history of the law, according to Justice Department officials. In addition, seven others were charged, including five people in connection with the Rolls Royce bribery scheme. "Effective deterrence of corporate corruption requires prosecution of culpable individuals," Deputy Attorney General Rod Rosenstein said at the 34th international conference on the Foreign Corrupt Practices Act in November. "We should not just announce large corporate fines and celebrate penalizing shareholders."